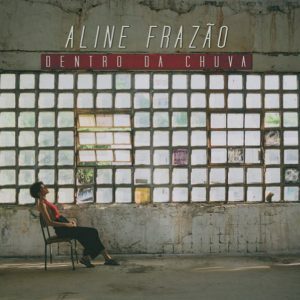 Singer, songwriter, and guitarist Aline Frazao grew up in Luanda, Angola, and came to Portugal when she was 15. She soon started to write songs, endorsed both Fado and Bossa Nova and the music of Cape Verde. Her third album “Dentro Da Chuva” came out last month. The eleven very minimalistic tracks on offer are simply a joy to listen to, like the extremely uplifting “Sumaúma” with its background vocal chant and the irresistible rhythm. Backed only by her guitar, the occasional percussion (by Zero Telles who also plays the kalimba here), guest musicians like Joao Pires, Jaques Morelenbaum, and singer Luedji Luna from Bahia, Aline has come up with a strong and beautiful set of songs, focussing on her unique songwriting and singing style by mixing her own folkloristic sounds of Angola with the music of Brazil (the album was recorded in Rio) and her European home. Aline also surprises with a simple and effective version of the Serge Gainsbourg classic “Ces Petits Riens”. “Fuga” tends to veer towards the dramatic side of things and probably comes closest to her work on her former, experimental album “Insular”. But it’s her inimitable melange of tenderness and coolness, the poetic and the avantgarde sides of her artistry which makes this a highly entertaining album. Aline showcases her new work tonight at Kantine am Berghain in Berlin with shows following in Luxemburg (October 11th), Stuttgart (10/13), and Zurich (10/14) and additional shows in March in Munich (03/10), Bremen (03/12), and Vienna (03/13).